At AM Kitchen & Bath we’ve been working with Chicago area homeowners since 2008 to help make their home design dreams come true. From our humble beginnings as a small home design and build company, AM Kitchen & Bath has continued to grow into the team of professionals we take great pride in today. That’s why we are excited to announce the opening of our brand new design showroom located in the heart of Chicago’s western suburbs! Our new 1,600-square-foot state-of-the-art design center welcomes visitors with the very latest trends in kitchen and bath design from all the top brands. Whether you’re opting for a traditional or modern design for your next home remodeling project, our talented staff of experienced designers will help you choose the highest quality materials available for your budget. We proudly feature MasterBrand Cabinets, Emser Tile, Moen kitchen and bath pieces, Builders Lighting and Design, DuChateau flooring and wall coverings, and Pella windows and doors. At AM Kitchen & Bath, top notch customer service has propelled us into the successful Chicago area design and build contractor we are today. That level of customer service will be evident upon your first visit to our showroom. Each visitor receives our complete attention as we work through the inspiration and design for your project. Our showroom is located at 728 Veterans Parkway, Suite 116, in Yorkville, IL. We are open to the public from 9 a.m. to 5 p.m. Monday to Friday, and we invite everyone to visit, whether you’re just dreaming of a home remodeling project or you’re ready to choose your design and build team. Adam Ludwig and his wife, Meg, opened the doors of AM Kitchen & Bath in January 2008 after the builder Adam was working for was forced to downsize as the housing market declined in 2007. Always a self-starter, Adam used the opportunity to begin his own remodeling company. Through the years, AM Kitchen & Bath has completed hundreds of home remodeling jobs in the Chicago area with the business being built on the referrals of satisfied homeowners. Though the business has primarily focused on kitchen and bath redesign and build out, we also complete full room additions and complete custom home building. 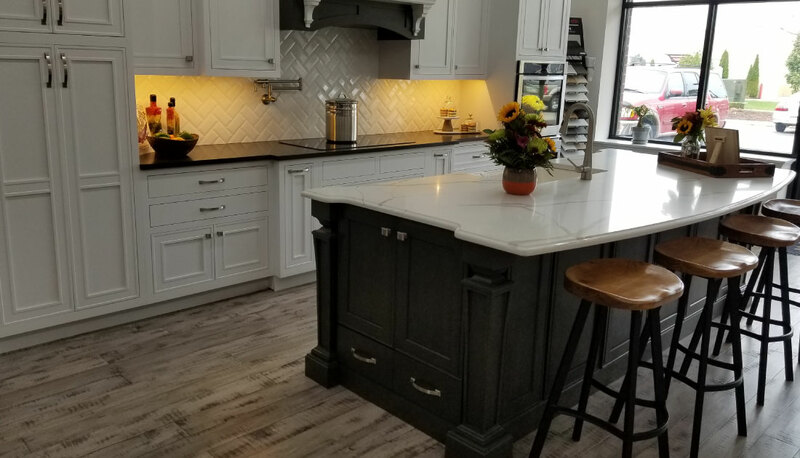 No matter the size and scope of your home remodeling project, the team at AM Kitchen & Bath treats every client with the very same level of care and attention to detail. If you are searching for a local contractor to complete your dream home remodeling project, contact us via our online form or call (630) 933-9323. At AM Kitchen & Bath, we want to provide customers with more than just a remodel. Our team will build a relationship with them and create an experience of transformation for the place they spend the most time—their home. We complete every transformation on time and on budget while incorporating each clients’ wants and needs. Our goal is to achieve complete satisfaction with attention to detail and unmatched customer support for home remodeling projects both big and small.